System Builder Sections and Categories. Click any link below to view the explanation. Recently added categories are shown with an asterisk *. Add Rule or Add Group? Choose one or more days of the week. Some feel Saturday's are difficult days as the racing is so competitive so you could choose all days apart from Saturdays as an example. Select the Course or Courses you want in your system test. When choosing more than one Course, you need to Add Group, not Add Rule. Select Group and Listed races only for flat racing, or Grade races for jumps, or select None to ignore all of these race types in your results. To find horses that were dropped 3lbs or more from their last run; Select less or equal and use a minus number, so -3. This will show horses that have been dropped 3lbs, 4lbs, 5lbs, etc.. Greater or equal a minus number, say -3, will find all horses that have been dropped -3, -2, -1, or nothing (=) as well as those that have gone up 1, 2, 3 and so on. To find horses that have gone up 3lbs or more since their last run; Select greater or equal 3. This will show all those that have gone up 3, 4, 5 etc. This shows the difference in the class of race between today's race and the previous race. Just read below for how to use the values correctly for this one. You need to think of a horizontal line where moving to the left is 'less than' or 'down in class' and moving to the right is 'greater than' and 'raised in class'. To find horses that were dropped 2 classes or more from their last run; Select less or equal and use a minus number, so -2. This will show horses that have been dropped 2, 3, 4 classes or more. Greater or equal a minus number, say -2, will find all horses that have been dropped 2 classes, 1 class, or nothing (=) as well as those that have gone up 1, 2, 3 and so on. To find horses that have gone up 2 classes or more from their last run; Select greater or equal 2. This will show all those that have gone up 2, 3, 4 etc. If you select just equal a minus or a plus number, -2 or 2, it will show just those that have gone up or down exactly your chosen value. Here you can pick horses that have won at the days Course and Distance. A horse may have won at the course before over a different distance and it may have won over the distance before at a different course. Just won over today's Course and Distance together before. This category will you horses that have shortened or lengthened from the early morning forecast prices to the Starting Price. This means you can see if horses have been backed in from their original forecast price or moved the other way. Sometimes this can give a signal to how the horse is likely to run. The Ability rating is worked out by the total amount of winning prize money a horse has had divided by the number of wins. So if a horse has winning prize money of 50,000 from two winning races, the ability rating would be £25,000, although we divide this by 1000 to give a more usable number of 25. The Form rating is worked out by adding the last three form figures together with anything over 10th place, as well as any letters such as F or P, counting as 10. Therefore a horse that came 3rd, 5th and 1st in it's last three races, would have a Form rating of 9. 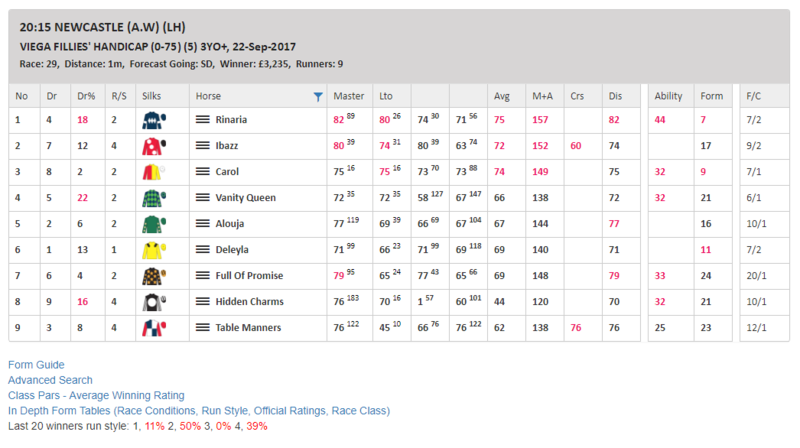 So you can search for greater/less or equals a particular rating number or you can look for the rankings too, where the horse with the 'lowest' Form rating on this occasion, would be rank 1. If you search for horses with Less than 10, you will usually find horses that have been running well as their form figures do not add up to very much. A horse that won it's last 3 races would score a 3. F/C: The forecast price can be used in the Odds section on the system builder. Some categories allow you to choose 'between' so you can choose more than one option. For example on Race Distance you can select 'between' 7f and 1m 2f and this is fine. ​However,if you want to select 2 or more selections from some categories then you will need to select Add Group. Once you have a new group it will be 'nested' separately on the system builder and to then add more selections in that group you need to again Add Rule, to that group. You also need to make sure that you change Add to Or when you have a Group, by clicking Or.